Today we’re featuring a guest post from Laksamee Putnam, highlighting her choices for librarians to follow on Twitter that reflect today’s profession! Recently on Business Insider the above image was used in a list of the 10 least stressful jobs in America. My bemused reaction can be appropriately animated through Twilight Sparkle. So, I’ve created a list of my own. Here are a few library people I follow on twitter, advocates for librarianship who better reflect us in the here and now. Librarians have broken out of the stereotype that image displays, we are using social media, following tech trends and contributing to the media culture of today. I think you’ll find us to be like any other professional group, frequently stressed out about our work, but still passionate about what we do. 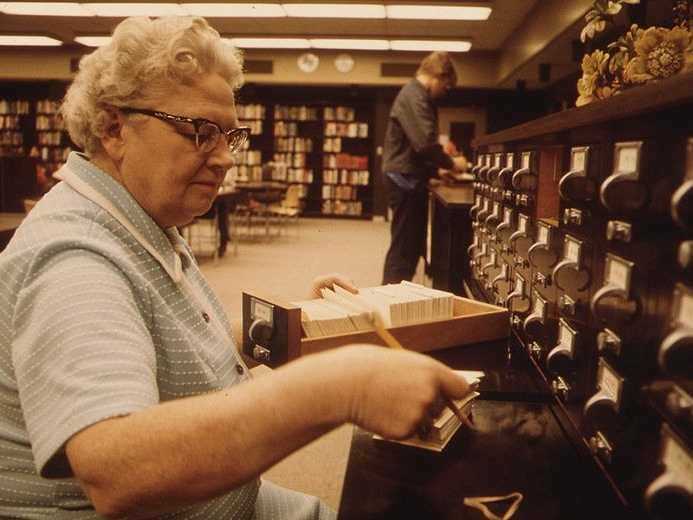 We could solve the librarian unemployment problem by hiring them to physically carry messages between #ALACouncil listserv members. Andy Woodworth is a New Jersey librarian. He was a 2010 Library Journal Mover & Shaker. Andy even managed to get a response from the Old Spice guy. You can read more about that and more on his blog. His twitter feed is a great mix of real life, library humor and library advocacy. Edited by four stylish librarians who are worth following in their own right (@pumpedlibrarian, @catladylib, @magpielibrarian, & @beccakatharine) Librarian Wardrobe originally began on tumblr, archiving and showcasing how librarians do not fit the stereotype of the image above. Be on the look out, and be ready to look your best at Midwinter or Annual! A librarian at Middle Tennessee State University, Jason Vance recently gained infamy through his tumblr, The Lives and Deaths of Academic Library Staplers. However, I previously followed him when he was active on @politelibrarian and blogging for A Librarian’s Guide to Etiquette. Jason is a great candidate for #followalibrarian, his days are filled with humorous accounts of meetings, reference interactions and typical academic library antics. The Librarian in Black recently celebrated it’s 10th birthday! Sarah Houghton has a a great voice and is a wonderful resource for technology in libraries. Her posts are thought provoking and her library advocacy is always strong, well thought out and practical. I highly recommend reading through her blog and following her. David Lee King is the Digital Services Director at Topeka & Shawnee County Public Library. His active twitter and blog presence make him a fount of technology information. Frequently, his reviews of digital tools and examples of creative uses of social media within libraries have inspired me to start a new project. This is real life people. Nothing describes the insanity of a workplace better than a well worded and executed GIF. The tumblr gets funnier the longer you read, but be ready to explain to your coworkers why you’re laughing uncontrollably in your cubicle. Props to @williamottens for creating something that makes the stress of my day manageable. Aw shucks – thanks for reading!